Are you aware of or alarmed by how many of our freedoms we are losing in America, particularly the freedom to express our strongly held religious views both in conversation and even more so from the pulpit? At least one of the reasons for this is because a lot of us are suffering from “historical amnesia.” The good news is there is a cure! 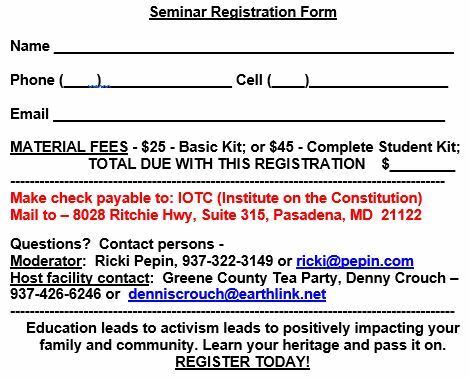 The Greene County Tea Party is proudly hosting this one-day seminar entitled “The Truth of America’s Founding – Your Heritage and Mine,” presented by Mrs. Ricki Pepin from the “Institute on the Constitution.” Through the use of primary source documents, we will discover America’s Biblical foundations for freedom, how far we have strayed from them, and how we can work together with Christians and other concerned citizens to restore them. Please see the details below – dates, times, cost, registration – and kindly consider sharing this invitation with your church, your family and other concerned citizens. Education leads to activism leads to positively impacting your family and community. Learn your heritage and pass it on! MISSION STATEMENT: To demonstrate the role of God and the Bible in the establishment of the United States of America and how our American and Christian heritage is intertwined. SPECIAL GUESTS ATTENDING: Ohio State Senator Bob Hackett and Ohio Representative Bill Dean. Amazing information from Christopher Columbus’s diaries. The surprising foundation for American law as stated in the Declaration of Independence. Key doctrines of the Constitution that will expose many erroneous modern-day teachings, including what the phrase “Separation of Church and State” really means. Modern Day applications: How to work together Constitutionally to protect LIFE, LIBERTY, and PROPERTY. Includes Student Manual, DVD and three books specified on Registration Website below. Limited walk-ins accepted with coordination-see contacts below.